We are the Pennsylvania affiliate of the National Earth Science Teachers Association (NESTA), whose mission is to facilitate and advance excellence in Earth and Space science education across the state of Pennsylvania. We welcome new members who will share their ideas, their vision and their energy with us – join PAESTA today! Facilitate and advance excellence in Earth and space science education across the state of Pennsylvania. To this end, we will provide instructional materials developed using high-impact pedagogical practices and aligned with state standards; develop and disseminate materials around advocacy for our field; and provide opportunities for members to be part of this community and to grow as leaders within and beyond PAESTA. 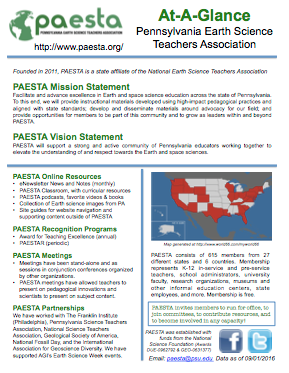 PAESTA will support a strong and active community of Pennsylvania educators working together to elevate the understanding of and respect towards the Earth and space sciences. Find out find out why NESTA is needed, and why you should become a member. The NESTA site also provides information about upcoming professional development opportunities, meetings, awards, position papers of NESTA and associated organizations, Constitution and Bylaws. Learn more about the history of NESTA and some background information on Earth Science.